The Free Design were contemporaries of (and had a comparable sound to) the Association, but never had much chart success. Indeed, one of their songs, “2002 — A Hit Song,” pokes fun at their hit-less-ness and at pop music in general. Only “Kites Are Fun” (the title track from their 1967 debut) cracked the top 40. But their close harmonies and beautifully arranged orchestral pop influenced many, including Stereolab, whose “The Free Design” is named for the group. Though they disbanded in 1974, the surviving members of the group — all of whom were siblings — reunited for one final record, Cosmic Peekaboo (2001). The group’s leader, Chris Dedrick, died of cancer in 2010. Duke Ellington’s Three Suites includes his version of Tchaikovsky’s Nutcracker Suite, from which this track comes. If this isn’t part of your music collection, get the whole album — which also includes Ellington’s arrangement of Grieg’s Peer Gynt, and Ellington’s original music for John Steinbeck’s Sweet Thursday. From the Fleshtones’ Stocking Stuffer, this is a cover of Milton Delugg and the Little Eskimos’ theme for the science fiction film Santa Claus Conquers the Martians (1964). One of my favorite Ella Fitzgerald holiday tunes (another is on the first Essential Holiday Tunes mix). I wonder, though, is it possible to listen to this song and not think of Freud? From the new Holidays Rule compilation, which I like nearly all of. I particularly like the way this song opens in a minor key — gives it a slightly darker undercurrent. The masters of power pop give us a catchy tune on Out of State Plates, their double-CD compilation of non-album cuts and outtakes. This is the real Fab Four, from their 1966 record sent to members of their fan club. El Vez offers up a rockin’ cover of José Feliciano. From El Vez’s Merry MeX-mas. 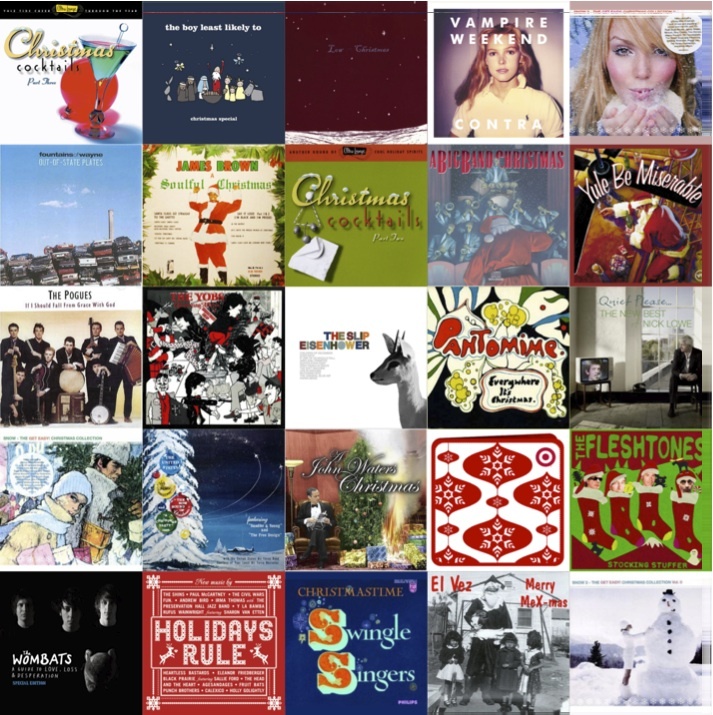 This appeared on The Christmas Gig, a compilation created by Target in 2010. Christy is perhaps best known for her Something Cool (1954), which in addition to the title track has great performances of “Whee Baby,” “You’re Making Me Crazy,” and “The First Thing You Know, You’re in Love.” She performed with Stan Kenton’s band in the 1940s, and retired in the mid-1960s… though I don’t know why. It seems to me that she could have had a longer career — along the lines of, say, Peggy Lee. This song appears on Christy’s This Time of Year (1961). A punk shredding of Ray Evans & Jay Livingston’s classic. From the Yobs’ Christmas Album. Written in 1934 by Felix Bernard (music) & Richard B. Smith (lyrics), “Winter Wonderland” has been recorded in hit versions by over 150 artists, including two hit versions in 1946 — one by Johnny Mercer, and the other by Perry Como. Ella Fitzgerald has a version on her Ella Wishes You a Swinging Christmas (1960), a great holiday record. And, yes, many great versions — Chet Baker, Eurythmics, Brian Setzer…. Peggy Lee’s recording appears on the compilation Christmas Cocktails, and (I’m sure) on several other compilations. From Contra, the band’s second LP. A swingin’ little number that deserves to be better known. Appears on A Big Band Christmas and on other compilations. An Afro-centric re-casting of “I Saw Mommy Kissing Santa Claus,” featuring Teddy Vann’s daughter Akim. This appears on A John Waters Christmas (2004), though without Teddy Vann’s permission. Apparently, Vann sued Waters over it. Mr. Vann passed away in 2009; I’m not sure about the results of the lawsuit. I do know that the John Waters Christmas album is currently the only CD on which you can find this song. Appears on the Boy Least Likely To‘s Christmas Special. “Little Drummer Boy” may be my least favorite Christmas song. I’m including it here because the Soulful Strings have recorded a really great version — the sole recording of this song that’s actually listenable. It surprises and pleases me every time I hear it. From the band’s album, Eisnhower, some sympathy for people born in December. This appears as a bonus track on the 2008 re-release of the Wombats’ first LP, A Guide to Love, Loss & Desperation. Even more uptempo than the Low song, but with more downbeat lyrics: “Here comes our darkest end. / Christmas is here. / It’s about not extending the overdraft / to scrape out what is left / at the end of the year.” The Wombats are one of my favorite contemporary pop groups. I recommend both of their albums. One of the all-time great holiday songs. Love, conflict, and a little profanity, too. Dorian Lynskey wrote a great history of the song, which ran in the Guardian last week. I recommend it. The piece also embeds an early demo version of the song, which is fascinating. But go and read the article. It’s well worth your time. “Searching for light, and can’t seem to find the right star.” A no. 2 pop hit for the Staple Singers, this song originally appeared as a single. It later appears on The Very Best of the Staple Singers. I have it from the compilation Snow 3 — The Get Easy! Christmas Collection Volume III. This is the first recording of the song made famous by Elvis Costello. Written and sung by Brinsley Schwarz’s vocalist Nick Lowe, the song’s message makes it apt for a holiday mix. It’s also been a source of lots of royalties for Lowe: Curtis Stigers covered the song for The Bodyguard soundtrack, which sold over 40 million copies. Ending the mix with a gentle a cappella medley. The final song on the Swingle Singers’ Christmastime. Philip, have you tried Rare Silk’s Little Drummer Boy? Makes me dance. Thanks for the tip! I don’t know this recording. Will check it out.